Combine flour, baking soda, baking powder, and salt in a medium bowl. Set aside. Add the dry ingredients to the creamed mixture ½ cup at a time until blended. Add the chocolate chips by hand. Drop dough onto ungreased cookie sheet using a small scoop about 3 inches apart. Roll dough into balls by hand. Bake one sheet at a time on middle rack for 12 to 15 minutes until cookies are light brown on top. Cool two minutes on cookie sheet, then remove cookies to foil or a cooling rack to cool completely. In the bowl of a kitchen mixer combine water, yeast, and sugar with a fork. Let stand for five minutes. Next add the remaining ingredients, and mix with a dough hook until all ingredients are well blended, 3 to 5 minutes. Cover the bowl with plastic wrap, and let sit in a warm place 10 minutes. Press dough onto a lightly oiled pizza pan, or cookie sheet (the oil gives the crust extra crunch and prevents sticking) and top with your favorite toppings. Bake for 15 minutes or until desired doneness. In a large sauce pan heat the olive oil over medium heat. Add the onions and cook until they become translucent. Add the celery and cook for two minutes. Add the carrots, salt, pepper, bay leaf, and chicken and cook for 2 to 3 minutes until all the seasonings are well incorporated. Pour the water and bullion cubes into the pan, and increase heat to bring the soup to a slow boil. 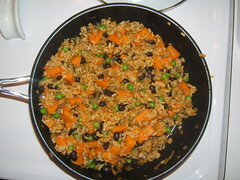 Once the soup is boiling, reduce heat and place a lid on the pan and simmer for 10 minutes. While the soup simmers, combine Bisquick and milk in a medium size bowl. Drop dough into the boiling soup 2 tablespoons at a time to form dumplings. Once all the dough is in the pot, cover and cook an additional 10 minutes over low heat. Stir dumplings occasionally. Enjoy. * Each week I prepare 3 or 4 boneless, skinless chicken breast in my crock pot to shred and have on hand for recipes later in the week. Season the breast with salt and coarse ground black pepper, then place them in the crock pot with 2 cups of chicken stock, and cook on low for 8 hours. Preheat oven to 400°F. In a small glass baking dish place the salmon fillets skin side down. Season the fillets with lemon juice, salt, and pepper. Place 2 Tbs of brown sugar on each fillet, then mash down. Bake for 10 to 15 minutes or until salmon has cooked through. Drizzle each fillet with some of the sauce before serving. Preheat oven to 400 degrees. In a large cast iron skillet heat the olive oil over medium high heat. Add the garlic and saute until light brown. Add the potatoes, rosemary, salt and pepper. 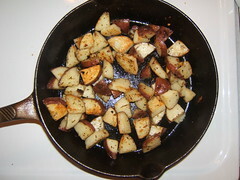 Stir to coat the potatoes, then allow them to brown in the skillet for two minutes before stirring a second time. Add cayenne and allow the potatoes to brown another two minutes. Place the skillet into the oven and bake for ten minutes. Give the potatoes a good stir, then cook an additional five to ten minutes more. 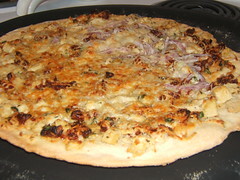 Top with shredded cheddar, sour cream, bacon, and chives. 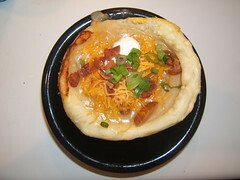 Toss all ingredients together with 1 1/2 cup cheese. Spread mixture over dough and sprinkle with remaining 1/2 cup cheese. Bake at 400 for approximately 20 minutes until golden brown. let rest for several minutes then cut into wedges and serve! Marinate chicken overnight or for several hours.